If you’ve ever wanted to soar over the surface of Mars, now you can – through the simulated eyes of the powerful mineral mapping camera now circling the Red Planet. CRISM View, created by the Johns Hopkins University Applied Physics Laboratory team that designed and operates the Compact Reconnaissance Imaging Spectrometer for Mars, offers a look at the Martian surface as if the viewer were riding along with CRISM, one of six science instruments on NASA’s Mars Reconnaissance Orbiter. The application is available on the CRISM Web site, at http://crism.jhuapl.edu/science/CRISMview/. 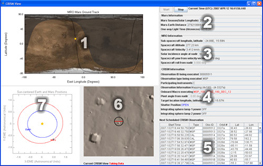 Based on the software CRISM team members use to monitor their instrument, CRISM View shows (in real time) the orbiter’s track, position and velocity above Mars; current CRISM instrument settings; a simulated view of the Martian surface below the spacecraft and the section of the surface in CRISM’s field of view; and a running list of CRISM observations. On-screen maps also illustrate the daytime and nighttime sections of the planet, and the current positions of Earth and Mars around the Sun. CRISM is looking for areas that were wet long enough to leave a mineral signature on the surface, searching for the spectral traces of aqueous and hydrothermal deposits, and mapping the geology, composition, and stratigraphy of surface features. Offering greater capability to map spectral variations than any similar instrument sent to another planet, CRISM can read 544 “colors” in reflected sunlight to detect minerals in the surface. CRISM View is the latest opportunity the team has taken to bring the mission science to students and Web visitors. Featured images, at http://crism.jhuapl.edu/gallery/featuredImage/, highlight selected CRISM images that capture Mars' geologic evolution and compositional variability. A curriculum guide, at http://crism.jhuapl.edu/education/curriculum.php, uses Mars as a springboard to teach basic geologic concepts. And the Reflectance Spectroscopy Lab, at http://crism.jhuapl.edu/education/reflectSpectLab.php, teaches users how to recognize different types of rocks that may initially look or feel the same, based on subtle differences in the light they reflect. APL, which has built more than 150 spacecraft instruments over the past four decades, led the effort to develop, integrate, and test CRISM. The CRISM team includes experts from universities, government agencies and small businesses in the United States and abroad; visit http://crism.jhuapl.edu for more information. The mission is managed by the Jet Propulsion Laboratory, a division of the California Institute of Technology, for the NASA Science Mission Directorate, Washington. Lockheed Martin Space Systems, Denver, is the prime contractor and built the MRO spacecraft.